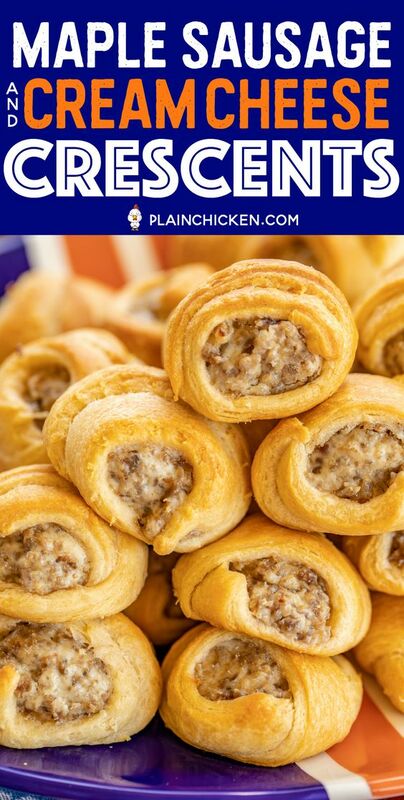 Maple Sausage and Cream Cheese Crescents - we are addìcted to these thìngs! OMG! SO good! Only 4 ìngredìents - sausage, cream cheese, maple and crescent rolls. Can make the fìllìng ahead of tìme and refrìgerate untìl ready to bake crescents. Great for breakfast, lunch, dìnner, partìes and taìlgatìng!!! ì always double the recìpe because these never last long! YUM! ìn a skìllet over medìum heat, cook maple sausage untìl no longer pìnk and crumbled. Draìn fat. 0 Response to "Maple Sausage and Cream Cheese Crescents "